My son Max often asks what we’re gonna do on family day and when family day is. It has become an important part of his weekly routine and it sure does mean a lot to him when his whole family can be together. It’s about bonding time, tradition and just being able to spend quality time without TV, the computer, errands and cleaning. If you have kids, you’ll probably agree, part of the adventure is not really knowing how it’s all gonna turn out. You just cross your fingers and hope that what you do won’t be full of stressful challenges. But even coming up with an idea or a plan for the day can be a challenge in itself. So look no further – Here’s a stress-free Door County family day idea that will be enjoyable for everyone! 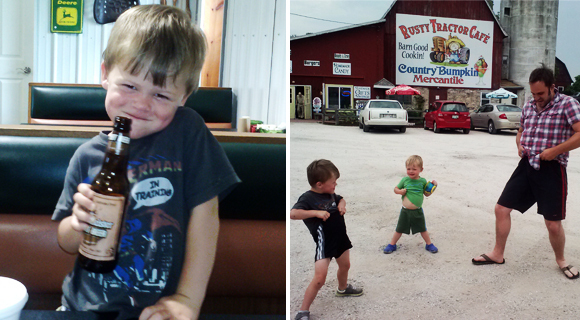 The adventure starts with lunch at Rusty Tractor Cafe. Then soaking up some sun at the beach at Frank E. Murphy Park, shopping at Kid Works, dinner at Not Licked Yet, and to Double Delites for dessert to top it all off. First things first, take a couple hours in the morning to get ready and pack a few bags. You don’t have to go crazy and overload with stuff. Just make sure you have the essentials. It’s always a bummer coming home with a huge load to unpack, especially when you didn’t even use half the stuff you brought! First stop – lunch at Rusty Tractor Cafe! You’ll love the big red barn atmosphere, the place is a very clean, open concept and the food is excellent. We tried the signature Hen House sandwich, which is chicken salad with Door County cherries. We also tried the Thresher on flatbread – which is basically a turkey club – but the quality of the oven roasted turkey and Applewood smoked bacon makes all the difference. It was a tough choice though – they had a lot of tasty sounding options! The flatbread pizzas are a great choice for kids and you can even spoil them with a Baumeister Rootbeer to share. If you don’t already know, Baumeister is one of 6 Delicious Root Beers That Are Made in Wisconsin. While your lunch is cookin’, check out the awesome vintage gifts they have there. You can find some pretty neat antiques! 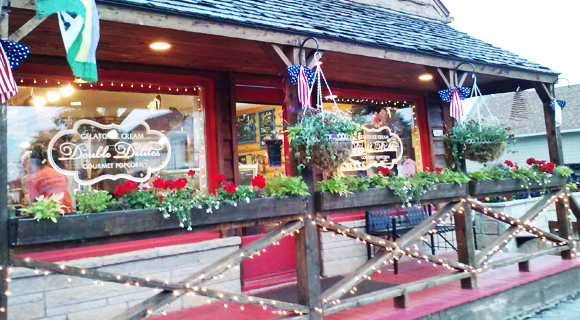 They also make homemade candy and fresh fudge if you have a sweet tooth on the way out. Next stop – Frank E. Murphy park located only about 3.5 miles North of Rusty Tractor Cafe. It sits on the coast of Horseshoe Bay with 1,600 ft. of sandy beach, a large dock, a two-lane boat launch, sand volleyball and a small play area with swings and climbing bars. The park also has picnic tables, grills, a shelter to rent and a changing and bathroom facility. Don’t worry about having cash for this park – it’s free! Our family spent three good hours basking in the sun, playing in the sand, making water holes and swimming out on the sand bar. This is definitely a part of the trip when you’ll get to relax. Yep, that’s right. 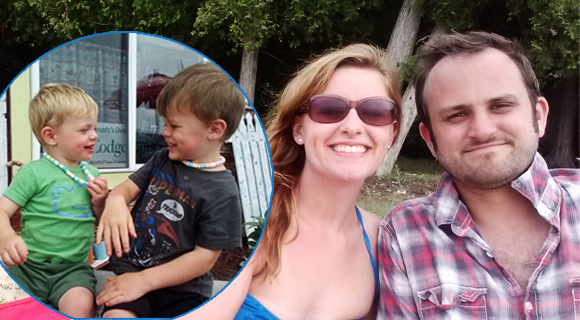 We all know relaxation is a rarity when you’re raising a family! But not on this day trip. Kids of all ages will enjoy exploring the beach and playing in the water, while you lay out and chill for a while. Although, I’ll admit – swimming on the sand bar with the whole family was a highlight for me. We saw a man grilling 4 cobs of corn for himself while sitting on a stump playing guitar. There were a few families having picnics, an older couple fishing and people on boats, kayaks, and jet skis out in the bay. After scoping out the dog situation, we found out pets are allowed on a leash, but we did see a few dogs without a leash. Even though the sign warns a $50-$500 fine, others decided to take the risk, and we didn’t see any park rangers around if that helps. Just make sure to pick up the smelly evidence. Lol. Next you’ll head to Fish Creek to check out Spielman’s Kid Works, which claims to be the largest toy store in all of Door County! Just hop back on highway 42 and head north for about 10 miles. Your kids will love this store, I promise. It’s not the same kind of toys you’ll find in a big box store like Walmart or a Toys R Us. It’s unique toys, games, puzzles, gadgets and other hand-crafted toys that are even fun for adults to play with! The business is run by a mother and daughter, and Bob Spielman does the woodworking. We saw a little wooden picnic table for kids with a bright colored umbrella and four cute sturdy wooden chairs for only about $200. I really would have liked to get that table, but we ended up getting a cool learning game puzzle and some neat wind up frogs that do somersaults instead. Something to keep in mind…this store is perfect for Christmas shopping too. They have lots of good sales in November right before they close. (They close right after Thanksgiving). One convenient part about it is, they have a large play area for kids upstairs with a big boat to climb in. So, while the kids play – you can shop. Dinner is pretty much a walk across the street at Not Licked Yet. This place is great! The freshly made frozen custard is a popular reason to stop, but you can also dine for a meal inside or out. 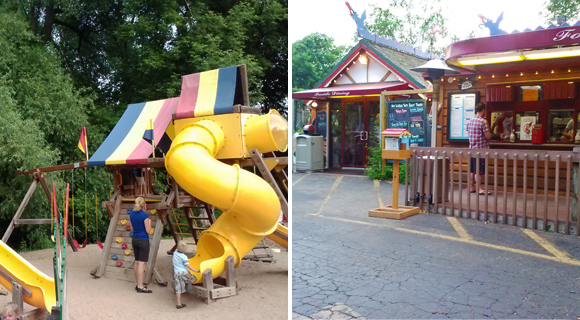 Plus, while you’re waiting for your food, the kids can hang out on the playground equipment. There’s a little creek and tables outside surrounding the playground. 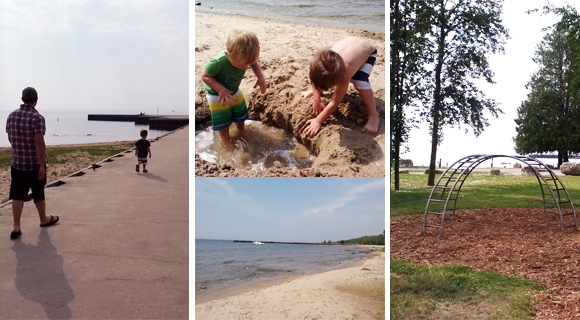 I love that it’s on top of sand rather than wood chips – Max went barefoot. One nice thing about their menu is all the gluten-free and vegetarian options, and they use grass-fed beef for their hamburgers. They also use local and organic ingredients as much as possible. The hamburgers and “grease-less” french fries are excellent. My husband said they remind him of In-& Out Burger fries. I tried the Red Pepper Formaggio Panini, which was like a spinach and artichoke dip grilled cheese sandwich. It was delicious! Last stop – Double Delights in Egg Harbor for some homemade Gelato ice cream. 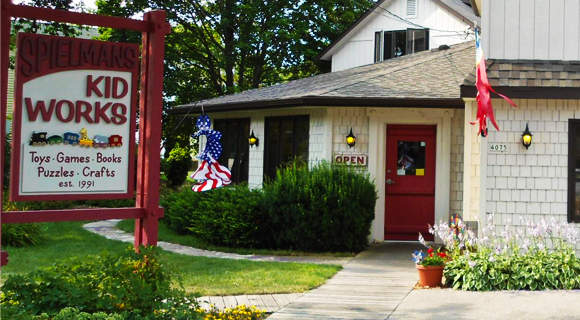 Head back south on highway 42 – it’s located right in the center of Egg Harbor next to the Main Street Market. Gelato is an Italian word for ice cream. It has much less fat than the ice cream you know of. The taste is light and refreshing, and has a richer flavor than what you’re probably used to. It’s made with natural ingredients including wholesome milk, fresh fruits, nuts and dried fruits. Max loved his mango flavor, which I honestly thought tasted kinda funky. I loved my lemon, Milo’s strawberry and my hubby’s forest berry too. They have a good variety of unique flavors that you can sample before you choose. The smallest dish looks pretty darn small, but when you eat Gelato – it goes a long way. Double Delites also has some unique gifts, crafts and wonderful smelling soy candles which burn cleaner than regular ones. All sorts of gourmet popcorn too! By this time, everyone will probably be ready to head home after a long fun-filled day. The kids will probably conk out on the car ride, which if you’re like me, not having to go through the whole “I’m not tired” bedtime drama once in a while is kind of nice! So, maybe you’ll want to switch it up a little and have a picnic lunch at the beach or get frozen custard at Not Licked Yet rather than Gelato at Double Delites. But, however you choose to do your day, we hope you got a few good ideas for some fun and stress-less things to do on your next family day! Subscribe to WhooNEW free so you don’t miss more Family Day with the Steinbrincks ideas to come. And if you have an idea or anything else to add, leave a comment – we love that!